An updated ds9 regions template (The default one installed with ds9 before 2018 was incorrect). Binospec is an imaging spectrograph with dual 8'x15' fields of view, and a very compact layout for excellent stability. It has dual slitmasks which can hold up to 150 slitlets for multiobject spectroscopy. Superior sky subtraction with these slitlets will allow Binospec to reach 3-4 magnitudes deeper than Hectospec. Binospec uses the fiber spectroscopy configuration of the corrector, which has built-in atmospheric dispersion compensation. The spectral range of Binospec is 390 to 1000 nm. Binospec has 5000Å of spectral coverage at 6Å resolution to 2100Å of spectral coverage at 2Å resolution. 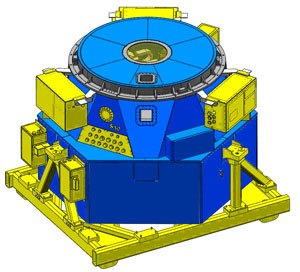 Commissioning for the instrument occurred in November 2017.